Is Google Drive better than Dropbox? This is a little bit misleading. They are not really the same thing. However, I find Google Drive to be a much better tool than Dropbox for what many people often use Dropbox for. Google Drive is a much more powerful tool for collaboration and information sharing than Dropbox. I’ll go further and state, If you are NOT using Google Drive, you should be. And for anyone else for that matter. I’ve been using Google Drive (formerly Google Apps) for nearly 8 years. Long before it became popular to talk about Cloud Computing, those of us collaborating on Google Apps have understood it’s value. Dropbox is a file-sharing repository. 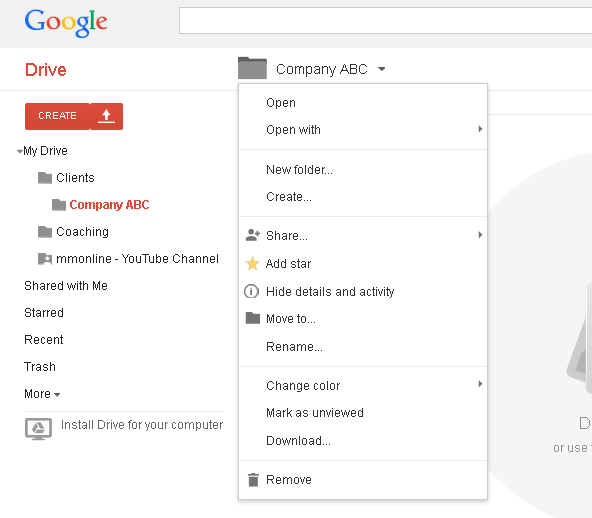 Google Drive is cloud-based applications and a collaborative work environment. Where people mostly use Dropbox to share a files with one or more people, Google Drive provides that same functionality but also provides real-time information collaboration and file sharing as well. Google Drive has a limited feature office suite. Similar to Microsoft Office, Google Drive provides an online editor for documents, spreadsheets, presentations, and simple graphics. There is also an online form editor that allows you to create fairly complex data collection forms. I’ll write another blog entry demonstrating Google forms and how you can embed them into your wordpress blog. The collaborative magic occurs when you share a document or folder with a team member or client. Multiple people can open the document simultaneously and work on it in real time. While editing the document, you will actually see 2 or more cursors, with a new color for each concurrent user. As users make changes to the document, all users can see the changes in real-time. No sending documents back and forth via email or uploading a document to Dropbox and worrying about version control issues. When you first use Google Drive, you have your Drive and you also have a “Shared with Me” folder that contains any individual documents or folders other Google Drive users have shared with you. Similar to your local harddrive, you have the ability to create folders and sub-folders to organize your documents. You can share individual files with one or more users – giving users the ability to view the document or edit the document. You can also make a document public – accessible to anyone with the link. You can also share folders in much the same way. This is a great tool for working with clients or mentees in a very dynamic and strategic way. I have both consulting clients – for Pulse Infomatics, Inc. – where we provide technology consulting and custom application development. I also have my coaching clients. Here is how an overview of how I organize information. For each consulting client, I create a folder. Then I create a folder beneath that. I share the bottom folder, “ClientName-sh” with my client. 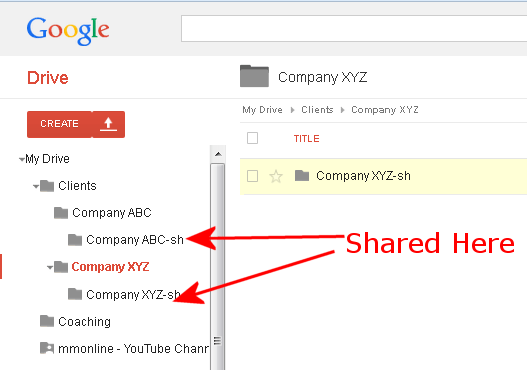 In this way, any documents or files – and any new folders I create – in my client’s shared folder, are automatically shared with my client. I share my root “Clients” folder with key members of my consulting team. In this way, we can store key internal client information in our first level client folder. Often, I’ll start a document in the first level client folder and once it is ready to be shared with my client, I move it to the shared client folder. Once the document is moved into the shared folder, it becomes available to them. I use a similar approach with my Coaching clients. I have several other projects I use Google Drive for. Whether for my music, school information, sharing family documents and photos, and more. Once your folder structure is in place and you share a folder appropriately, you can create new documents in that folder or drag and drop files from your computer. Google Drive is also available for your smart-phone, making your collaboration and information mobile. Don’t miss it!!! This is amazing technology. This is true Cloud Collaboration! In all cases, using Google Drive dramatically improves communication and collaboration. I’ll cover this in more detail in the future. Below are some of the screens demonstrating creating folders and how I organize sharing. I would love to hear from you!!! Are you using Google Drive? How so? 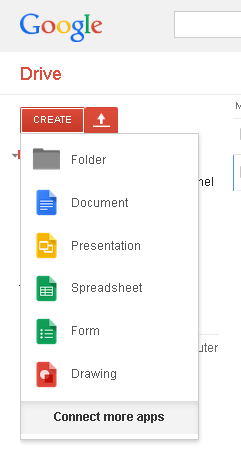 Creating folders or documents from the “Create” button. Clicking the sub-folder name to create a “New Folder” or “Create” a document. Sharing sharing or emailing collaborators. It’s a nice system, and my partners in Seattle and Nottingham (UK) regularly work with me in this space. It’s super nice to get an idea at a red light, pull into the next parking lot, and jot notes into a blank doc in the right section where I can find and polish it later. More people should know about this. Thanks for sharing, Matt. My wife and I want to share family photos with multiple family members. I need help in figuring out which apps to use to provide most flexibility and ease of use. I have both Google Drive and Drop Box on our Samsung Galaxy Camera but don’t know which app is better for our purposes and how to go about setting it up correctly. Are there any consultants out there who specialize in this field who I could employ on a fee basis? I would Google Drive. One Gmail account has to be the master for shared files.. but basically, go into drive, setup a “Family” folder and then maybe a “photos” folder. 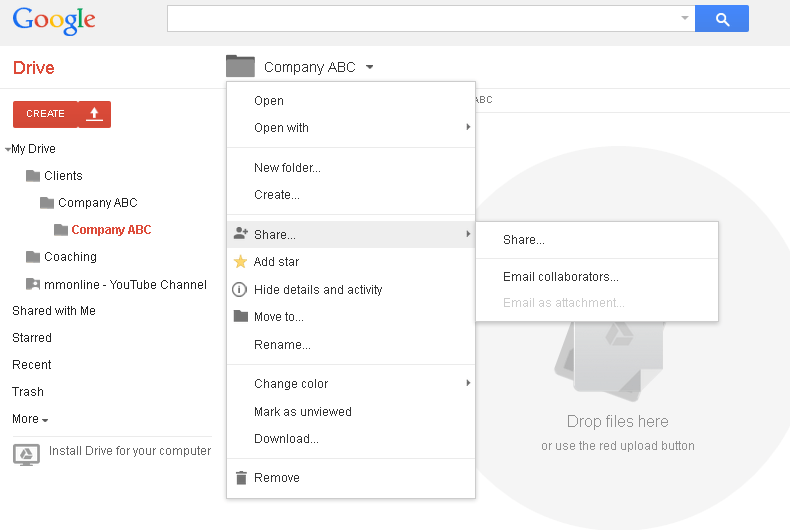 Share the folder with the other gmail accounts – for each person with a phone. They can then upload any photos to the shared folder of their choosing or create a new folder based on the photos being uploaded. Putthing the year-month-day ensure that the folders stay in a logical order.. year first, then month. 2 digits always for the day or month otherwise month 1 and month 10 are sorted together and month 2 after..
Brian.. sheesh! I just saw your detailed folder setup. Very nice. Thanks so much for the post! Can you help me sort out this folder development scenario? I am a swim coach that wants to communicate with athletes individually and across the team. How would you recommend ‘foldering’ this? Am I on the right path? And, can I embed video tutorials in the Team Folder and even ‘before’ and ‘after’ swim stroke analysis? Some communication I’ll want the entire team to see (calendar, practices to be done on their own, etc. ), but some items like goal setting I’d like to be private between me and the athlete. Feedback you may provide appreciated! To make sharing a bit easier, you might do this. This way, you share the open Water Team folder as read only for the entire team. Then you can share the individual athlete’s shared folder with just them. If you create athletes under the Open Water Team folder, each new folder will take on the read only permissions for all the athletes. You’ll have to remove and reset permissions every time.